The Pune Guitar Society(PGS) is excited to publish the first in a series of articles on the Russian composer Nikita Koshkin. 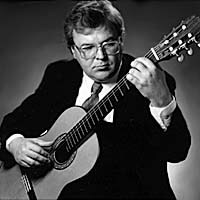 The celebrated Russian guitarist and composer Nikita Arnoldovich Koshkin (born 1956) needs no introduction to any serious modern classical guitarist. In a prolific performing and compositional career that shows no signs of abating, Koshkin has threaded a unique sonic voice into the history of the instrument, and his works continue to be played by guitarists around the world. I will not write down biographical notes on the maestro here, as this has been done adequately several times by many others, and especially so in the highly engrossing PhD dissertation by the Greek virtuoso guitarist Elena Papandreou. This is dedicated to Koshkin’s Megaron Concerto, but her biographical notes on Koshkin are also extensively and well worth reading. She has been a dedicatee of many Koshkin works and is also close musical associate. My first encounter with Nikita Koshkin’s music was in 2004, when I came across a DVD featuring John Williams playing the Usher Waltz, which happens to be Koshkin’s best-known repertoire piece. This is a texturally diverse and episodic composition, inspired by Edgar Allen Poe’s The Rise and the Fall of the House of Usher, and was like nothing else I had ever heard before. Soon after this, I listened to the Ballads Suite in a recording by Elena Papandreou, which seemed to be in a completely different musical style. The Ballads are a musically relatively conventional suite, and remain accessible to listeners despite their inbuilt complex and sophisticated harmonic treatment. Hearing these, I could well believe that Koshkin spent time in his youth playing rock guitar: the Led Zeppelin influences are quite discernible. Ballad V, in particular, was of great interest to me with its distinct sections and almost jazz-flavoured chord modulation. Intrigued, I ordered the sheet music for the Usher Waltz. The Ballads came in a larger Mel Bay collection of Koshkin’s music and did not arrive until two days before I had to leave for Korea for a work visit in August 2016. I really wanted to start on Ballad V and was planning to carry my guitar to Korea, but a wave of airline security scares in that month saw a complete ban on cabin baggage out of Mumbai. Not even a small case, let alone a guitar. I did find a workaround – by buying a gigantic suitcase that my Graduette collapsible guitar would fit into diagonally and which I could then check in. I ended up hauling that suitcase on a road trip down the length of South Korea from Seoul to Busan, and had hotel staff and colleagues wondering what I was doing with such a huge suitcase for a five-day visit. They were too polite to ask outright. But that is another story. Those “rubato moments”, to me, seemed a critical part of the Usher Waltz which is ostensibly a waltz, but sardonically celebrates its literary protagonist’s descent into insanity. To be honest, I wasn’t thinking of “rubato” in its orthodox sense, but had instead tried to imagine how a lunatic would stagger through a waltz. As for the end of the piece, I could only think of flies buzzing. Really. In the decade since then, with my core musical preoccupations centering into mainstream jazz and upright bass work, the little time that I had available for the classical guitar was largely invested into a selection of Leo Brouwer compositions. I did learn the entire Ballads Suite and played it in a couple of recitals, but did not approach any new Koshkin material for several years. Having worked through and performed Leo Brouwer’s Concerto de Toronto and the Concerto Elegiaco in 2016 and 2017, it was now time to look for other composers. After the highly rational and structured textures that characterise Leo Brouwer’s writing, it was difficult to relate to other guitar composers. I toyed around with a few scores by others, but they did not really draw me in. After the Brouwer Concerti, I needed something at least as magnificent. I then purchased a recording of Nikita Koshkin’s Megaron Concerto featuring Elena Papandreou and the Singapore Philharmonic Orchestra conducted by Lan Shui. I have to admit that the initial few (and admittedly casual) listenings did not impress me much. The dissonances seemed forced, the more melodic passages sounded trite, and the sections with soundboard and fingerboard tapping seemed gimmicky. But then, this was Koshkin, and I decided to make myself listen to it repeatedly until it made some sense. The Adagio in your Megaron Concerto is beautiful beyond words…. The music for the Concerto, along with a piano reduction, was soon obtained from Edition Margaux. At this time, the Pune Guitar Society was also thinking of our next major recital event, having organised a Brouwer concert in 2017. The idea of preparing a Koshkin-themed recital became self-evident. At the time of writing, I am working on the Megaron Concerto here in Pune. Rosemarie Eilert, who has been my long-term musical collaborator through countless mainstream jazz performances as well as the Brouwer concerti, is out there in Sydney with the piano reduction. Kabir, Justin and Kuldeep have all made their solo Koshkin repertoire selections which will all feature in a concert dedicated to his work, possibly during January 2019 in Pune. I believe it will have an unprecedented sonic diversity, but will actually present only a small subset from the oeuvre of the maestro. The Megaron, in its 35-minute length, contains a vast musical landscape within itself. The second Allegro Assai movement has a simple theme which remains simple, even as a world of sophistication emerges gradually around it. The final Vivo has some genuinely satisfying Aeoliean passages in D minor which gradually yield to a revisiting of the macabre overtones from the first movement. The guitar parts for the Megaron are fiendishly difficult, and constitute the most challenging music I’ve ever taken up regardless of genre. While the Papandreou dissertation provides an extremely valuable guideline (and her own recorded interpretation is umabiguously brilliant) it will be several months yet before I begin to reach some sort of cohesive performance standard. So far, I have sketched through the score several times, pondered over the musical strategies that each section will demand, and also identified several areas in which my guitar technique needs focused work to handle the interpretation. However, it is difficult to put down the guitar once I start a practice session on this work: it unfolds almost constantly, and in unexpected and delightful ways, with every reading. It has to be said: the fingerings in the published score for the Megaron were prepared by Elena Papandreaou and have been very well-considered indeed. This is the first time I am working on a score with close attention to fingerings, both for the right and left hands, without having to change anything. Well, except for a few places in which my sacrilegious tendency to use the 3 and 4 fingers for the odd partial barre takes over. I was in Korea again a few days ago. No, not with the guitar or the monster suitcase, alas, but I did listen to the recording several times in the hotel and on the flights. It continues to astonish and fascinate. Readers are encouraged to listen to the many published recordings of Nikita Koshkin’s music and to discover for themselves the essential body of work by this modern composer. The PGS looks forward to welcoming listeners to our own Koshkin concert, which will hopefully raise further interest in his enormous musical contribution.